Spanner in the Workz: "I have gone where my passions have taken me." Tool tales, art and reviews from Artist and Blogger, Natalie Parsley. "I have gone where my passions have taken me." Some blog posts are a chore, most a pleasure and then there are some which feel so significant, so important and so personal that writing them becomes a different experience entirely. This post fits into the latter and in its expectation and poignancy in influencing my own art practice has meant that collating my thoughts into writing this has been a slightly daunting process to begin! 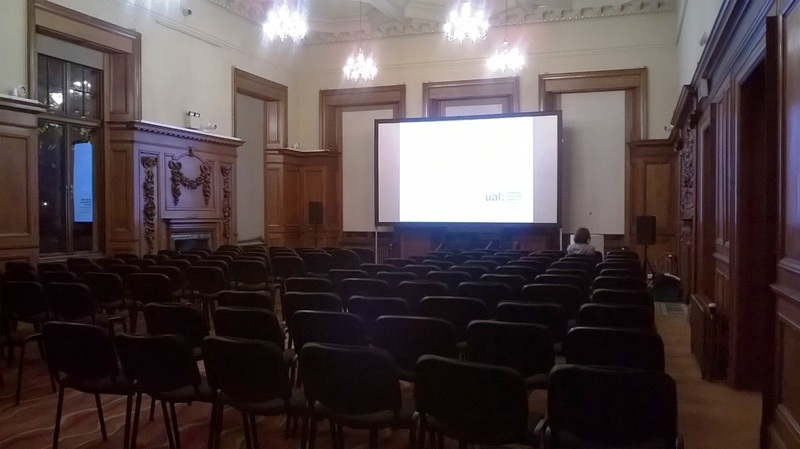 I was there to listen to one man, possibly the most influential artist on my practice (and who should need no introduction to those familiar with my work). The date was Wednesday November the 25th 2015. The event, ‘A Conversation with Jim Dine’. Hosted by printmaker and Professor of Fine Art at UCA, Paul Coldwell, the evening was set to be a conversation into Dine’s practice, focusing mostly on his printmaking but also setting the context of the diversity in his practice; from the 60s origins in New York experimenting in performance art alongside Allan Kaprow and Claes Oldenburg to the artist’s recent ongoing print series, a History of Communism. 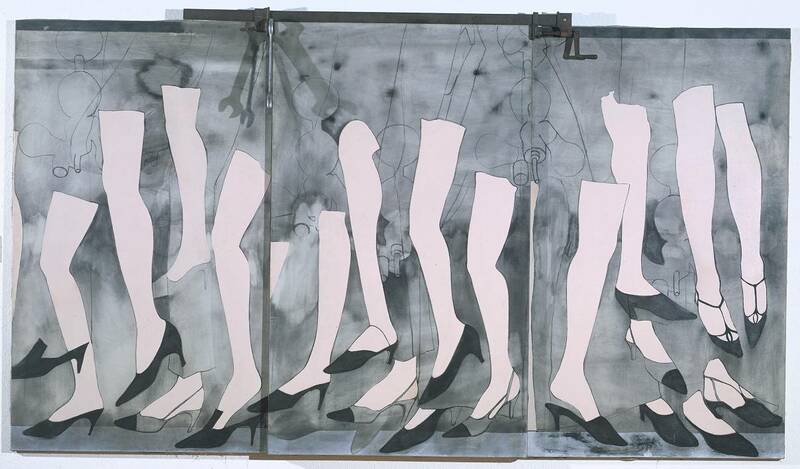 Now turned eighty, Dine’s career as an artist has spanned, drawing, painting, performance, sculpture and printmaking. An artist who defies categorisation but who has and continues to make work that is deeply personal and intense using his own developed set of iconography that includes, tools, heart motifs, bath robes, Pinocchio and birds. In my own work, Dine’s tool drawings and prints have been a significant influence in both the importance and intensity I place upon the process of drawing, the choosing of tools as a subject and how I depict the objects [tools] themselves in the work. In addition, Dine has always made numerous self-portraits and for those not familiar with these and his appearance, visualise, a more intense-looking version of Terry Pratchett minus the hat! I say this in reverence, for I was sitting as close to the front as I could get, minus the VIP rows (reserved largely, it would seem for the unfashionably late). The anticipation, for me at least, was immense! The evening began with a question from Coldwell asking Dine to give a flavour of what life was like during the 60s in New York; the beginnings of Pop Art and ‘Happenings’ performances. Dine replied that New York was without art collectors, dealers and gallerists, it "was a world we made ourselves" and quite literally in some ways with many of the performances including self-made sets and props from cardboard and found objects. He spoke of the ‘need’ to make work with Claes Oldenburg in what was a collegial atmosphere between the artists. It set the tone really for what became and still is the working ethos of Dine’s mentality to making art; prolific, bold and drawing upon the technical knowledge of others. The performance made-way for frenetic, gestural mark-making and has been the visual handwriting of the artist throughout his career. His work is charged with a psychological need, what could be described as a cathartic outpouring in the desire to make work and express oneself. Later in the conversation he stated, “I need to work with my hands...its physical for me”. Dine’s answers at this point were relatively short and matter-of-fact as I got the sense that they were questions he’d been asked many times before, but were in-part necessary for setting the scene. Although Dine didn’t continue with performance as an art form after the 60s, the qualities that came from the early happenings never really left Dine’s work, with some of the ideas about using everyday/found objects staying within the work and more significantly the way in which Dine continued to depict tools/inanimate objects as though they were ‘alive’ often positioning them erect as though standing or at other times framing the image as though they were substitutes for actors on the stage. Some of the aspects of 'performance' remained. Elyria (2000) Charcoal on etching felt. 104 x 129.5cm. Dine became more animated when talking about printmaking processes and drawing. Stating how he felt that when he tried silk screen whilst he was living in London, that the mechanical ‘flatness’ took what he called “...the life out of it”. As if to say that etching and lithography offer a much more hand-drawn type of mark. He went on to say that, “Drawing is part of everything for me.” This is evident in his painting and even his sculptures which are as carved, angular and often feature the same type of harsh, hatched mark-making as the prints. From my perspective this was probably one of the most affirming quotes of the talk and echoes a belief I have long had toward my own practice, that nearly all visual thinking and creativity begins with drawing and that the more successful sculptors, films, performances and installation begin with some sort of drawing within their development. And for some the ‘drawing’ even becomes the work itself. Drawing is an embodied process and there is something of working with hands for drawing that is similar to working with the hand tools Dine depicts. 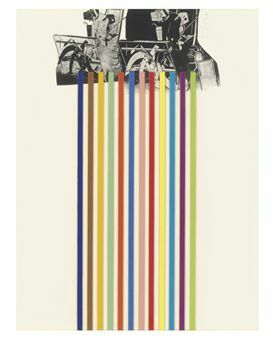 Tool Box 10 (1966) Screenprint on paper 603 x 478mm. Many times throughout the evening’s talk I had the impression Dine was an artist that was very ‘real’, honest and not a fan toward some of the over-intellectualising of his work. This is refreshing and in-fact most times I have heard any artist talk about their work, they are nearly all often demystified as not being as academic and analytical about their own work as often reading about them alludes to. In part Dine’s compulsion to draw came from he admits his own dyslexia and that drawing was a way of expression without words. He said that it also helped him be able to work backwards, naturally, a skill useful in printmaking. Dine spent many years growing up and eventually working in his Grandparent’s hardware store, which inspired Dine to use tools in his art. In what John Russell describes of Dine’s work: ‘Daydreaming amongst objects of affection’. Prolific in his depiction of many of the tools found there, the tools became a familiar iconography/trademark of Dine’s work. The tools reoccurring so frequently and with such intensity that Dine himself has stated they became self-portraits. The conversation moved to focusing on Dine’s ‘Winter Tools’ series of hand coloured etchings. 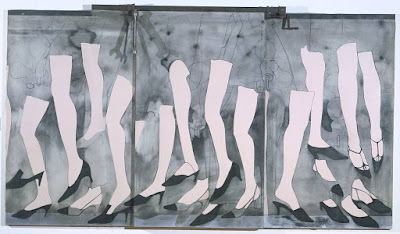 Coldwell stating that these works have been said to compare to ‘Degas’ Ballerinas’ in their delicate line work and intent of placement within the ‘frame’ of the page. Described by Coldwell as, “Objects of desire/more alive than human”. They very much have a feeling of movement and life to them despite obviously being inanimate objects. The former statement met by much amusement to Dine, who tended throughout the eve to be very sceptical and apprehensive of interpretations of his work generally. I like his response better, “These tools are dignified...developed by guys who worked with their hands.” In many ways that’s what I’ve always been interested in too; there is a reverence and life of potentiality in tools as objects, their past histories and future possibilities charging these objects with a sense of purpose and in doing so shouldn’t be taken for granted. 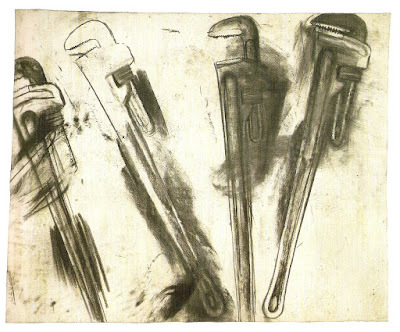 [No title] From 10 Winter Tools series (1973) Lithograph on paper. 707 x 558mm. Previous to this talk I hadn’t been that aware of some of the techniques and methods Dine uses to create his prints. He treats his plates like drawings, like paper. Speaking of the malleability of print and erasing as a way of drawing with power tools to sand/scrape back through layers in what was explained by Coldwell as, “...tension between classical print making and more urban approach.” Which slightly conflicts with the ‘hand drawn’ nature of some of Dine’s previous comments to which I suppose he still sees using the power tools as a way of making marks on a surface just not with a pencil or charcoal. Braid (1973) Etching. 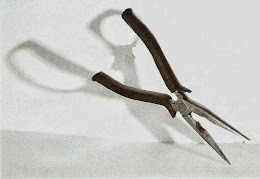 85.9 x 40.8cm. Another aspect of Dine’s practice that I had previously mentioned earlier was that he is dyslexic and early in his education Dine used drawing was a way of communicating without words, a means of expression. This became apparent when the conversation turned to discussing the print ‘Braid’, Coldwell prompting discussion with the question, “Why write what it is?” To which Dine replied, “... it was about not having the confidence of being understood.” And even quite openly commenting in a good humoured, rather than remorseful way that, “It [the text on the print] is kind of dumb...I am in your face.” I definitely don’t think something has to be recognisable in order to be understood, instead this is an insight into some of the insecurity that perhaps Dine and I expect many artists feel in ‘wanting’ to be understood and have ones work understood by others (I've done the same thing myself in the past). Dine has always had links to poetry and words within his work and in nearly all his work there is an importance placed on the ‘recognisability of things’. Hearts, bathrobes, plants, tools are distinctive in his work but often semi-hidden or surrounded by intense, frenetic mark-making. It’s as though he is not content with being purely abstract and needs form to work from. Dine remarking that his ‘heart’ motif in many paintings/prints is simply a means of “something to hang the paint on”. As the viewer I want these hearts, tools etc. to mean more than perhaps Dine lets on, but at the same time I admire his tenacity to not want to over-complicate his work with his own brought meaning. Maybe much of the way these objects are represented owes something to Pop Art (though Dine may be reluctant to admit it) as there is a clarity, almost advertising-like way of presenting these familiar objects. A History of Communism (2012) Lithograph. The evening ended with a discussion on Dine’s on-going series of prints titled, ‘A History of Communism’ made from reworking lithograph stones found in a former Socialist art academy in Berlin. Previous made work by print makers is added, edited and worked over by Dine who stated that he saw these works as, “landscapes” and as Coldwell observed that in these prints the tools really do become animated and like actors on a stage. Dine references Pinocchio, a character often used in his work for its storytelling quality of what he calls, “a stick coming to life” which is in many ways, as I learnt this evening is a reoccurring idea in all his work. Coldwell notes that in the reworking of these stones that there is a contrast with the new life placed into these works with, “the deadening of the original lithograph”. Is it sacrilegious to appropriate/work into another artists work in this way? We don’t know the reasoning why some of these stones have been abandoned for many years by their owners particularly when it was created under conditions as repressive as those in Berlin before the wall came down (they’re estimated well over 25 years old). If anything the process is almost archaeological and their alteration reinvigorates them with new life and preserves them in a way they had previously gone unnoticed. The addition of tools and other imagery certainly adds a sense of the historical, the political and the confined which is also interesting given the circumstances when which these stones were originally worked into. Many artists may be offended at the idea of reworking someone else’s work but in this instance, I couldn’t think of anything more liberating and more flattering. After the talk had finished the audience were invited for drinks in the Green Room next door with the man himself. I’m delighted to say I got to meet him, but less so that after all my hype and anticipation, had absolutely nothing intelligent to ask or say! The evening wasn’t necessarily anything radically new or ground-breaking but reaffirmed many of my thoughts on the importance of drawing as a means of expression, the significance of a sense of life in inanimate objects, Dine’s commitment to his process/learning new techniques and above all his testament to shaping his career by following his passions/interests. That sounds pretty good to me. Sign up to receive my posts direct to your email! "Nonsense is better than no sense!" Natalie Parsley. Simple theme. Theme images by hdoddema. Powered by Blogger.